The Palestinian Health Ministry has reported that a child died, Saturday, from serious wounds he suffered a day earlier during the Great Return March procession, near the perimeter fence, east of Rafah, in the southern part of the Gaza Strip. 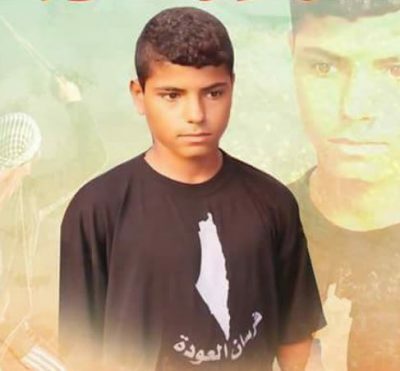 The Ministry said the child Ahmad Misbah Ahmad Abu Tyour , 16, was shot in the femoral artery in the thigh, before he was rushed to surgery, and then to the Intensive Care Unit at a Palestinian hospital. It added that the child remained in a serious condition until he succumbed to his wounds, Saturday. Sept. 9, 2018 3:02 P.M.
GAZA CITY (Ma’an) — A video documented the method of how Israeli forces targeted and killed 16-year-old Palestinian, Ahmad Misbah Abu Tyour, while he was participating in “The Great March of Return” protests in the besieged Gaza Strip. The video showed the Palestinian teen, while maintaining his distance, throwing rocks towards the border with Israel as a form of protest to the nearly 12-year Israeli siege of Gaza. Ahmad’s rock-throwing posed no threat to the heavily armed Israeli forces. The video also showed Ahmad raising his hands up, seconds prior to an Israeli sniper shooting him in the chest and causing him critical injuries. Ahmad succumbed to his wounds on Saturday morning.